AUGUST 2002: Class of 1999 inductee Billy Shaw donated six mementos from his Hall of Fame career. 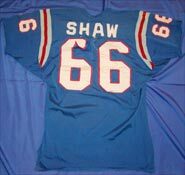 Shaw is the only member of the Pro Football Hall of Fame to play his entire career in the American Football League. He anchored the Bills' offensive line from his left guard position and helped lead Buffalo to consecutive AFL titles in 1964 and 1965. 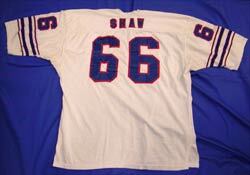 Road uniform from Shaw's rookie season in 1961. 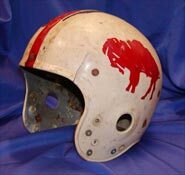 Billy wore this helmet during his final two seasons in 1968 and 1969. He noticed the crack at the end of the '68 campaign but because of his superstitious ways, he continued to wear it through 1969. The crack was less noticeable when the facemask was attached. Shaw was elected to eight consecutive AFL All-Star Games. This is one of his All-Star jerseys from late in his career. 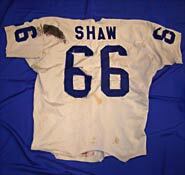 Shaw "hung up his cleats" following the 1969 season. 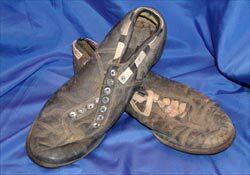 These are the shoes from that final year. 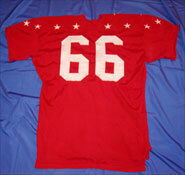 This uniform was from the mid-1960s, most likely from the 1964 season when Buffalo claimed its first American Football League championship. Billy wore this uniform for home games in 1962 or 1963. The jersey was Buffalo's new look after switching from the silver and blue worn during the franchise's first two seasons.